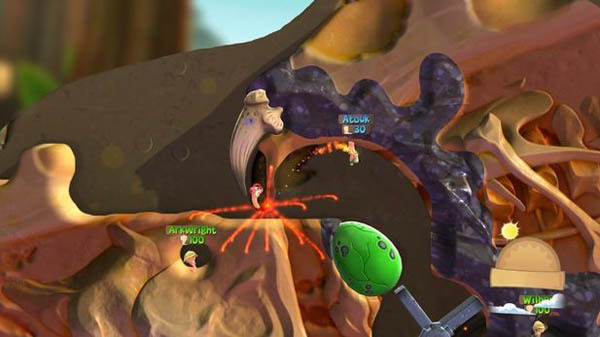 Worms has become a namestay franchise of the video game industry. When the cute and colourful turn-based strategy game hit PCs in 1995, the world was immediately hooked. 19 years and 24 games later and the world is still enraptured with the bright and cheerful, yet surprisingly violent ground-dwelling creatures. 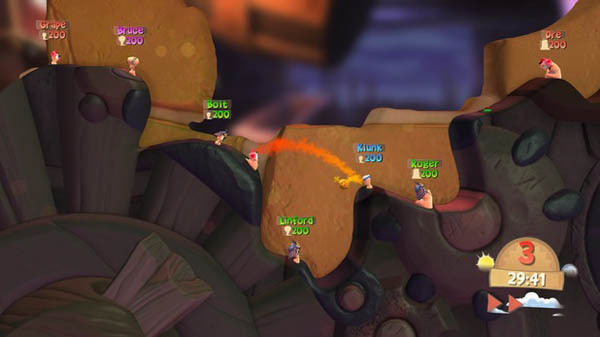 Worms Battlegrounds is the franchise’s first foray onto the next-gen systems, and while it can still offer a fun time (especially when duking it out with friends) there isn’t much here that we haven’t seen before. This was one section that prior to playing the game I was not expecting to write about. The game actually features a small little plot that ties together all of the single-player missions. Following on from her exploits in Worms Clan Wars, Tara Pinkle narrates the adventure which basically has you fending off opposing worm soldiers to aid her in her quest for mystical treasure. The story I small, and largely irrelevant but it is still nice to see a narrative holding together the missions. For those who haven’t played a Worms game before, they are traditionally a turn-based strategy game. Your goal is to wipe out the opposing side, by putting your Worms into position, and letting loose a barrage from whatever comically exaggerated weapon you have in your arsenal. Everything from sheep cannons to hard-to-aim rockets are par for the course here and they give Worms its delightful flavour. While previous Worms games have used a series of standard foot-soldiers (is that term applicable here? I mean they don’t have feet…) Worms Battlegrounds takes the class system that was introduced in Worms Revolution to offer a variety of different gameplay options for players. You can use Heavy Worms, Scout Worms, Scientist Worms etc. Each Worm acts in a different manner (and are all pretty straightforward) Heavies can take and deal more damage but move slower, Scouts move quick but are also glass cannons. Balancing your army of Worms is one of the game’s challenge. This was one of the best features of Recolution and it is fantastic to see it back. Not only do classes make a return, but so do clans. Hailing from Worms Clan Wars, the clan system allows you to customise the look and feel of your mighty wriggly squadron and take them into battle online. Did somebody say online? As with past Worms titles, Battlegrounds focus is primarily on its multiplayer aspect and this is where it truly shines. You can take your customised soldiers into battle against your friends and of course random strangers online, which provides a completely different experience to playing solo. (also, I feel I should be rewarded for not taking the low road and not making a joke about playing with your worm). You can play in local matches on through Xbox Live/PSN so you will never be want for a match to play. Even before the game had officially launched I had no trouble finding a match or two whenever the mood struck me. Ok so there has been one major addition to the formula that really does excite me; user-generated content. In Worms Battlegrounds you can finally design your own maps! You can build, test and upload your own customised battleground. It is a minor feature but one that in my opinion has been absent for far too long and one that ensures countless hours of fun. 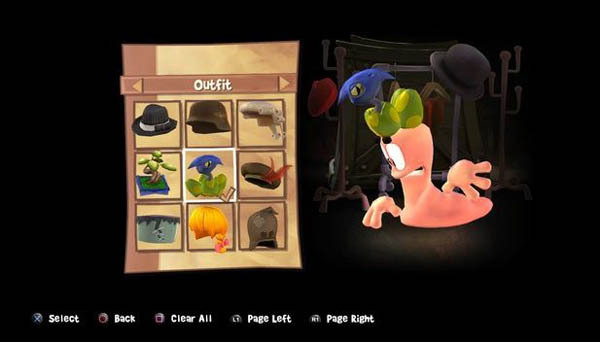 The Worms franchise has for a long time relied on the same art-style that has become synonymous with the brand. Over the top caricatures of anthropomorphic worms little the box art, the tutorial and every other screen of the game. 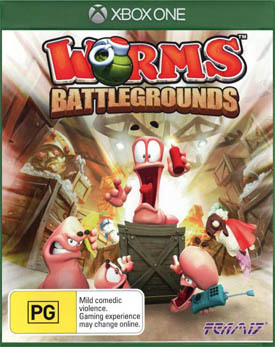 The worms are the namesake of the series and they are featured heavily. The cartoony and over the top art style makes it so that the game is fun for all ages. The weapons all look unique and varied and none feel like reskins of anything else. The fact that everything in this game looks and feels unique makes it one of the better entrants in the Worms franchise, and the genre as a whole. When it comes to performance, I didn’t notice a single glitch, input lag, screen tear or anything else that might make me think the game wasn’t running at optimal levels. It all runs beautifully and considering how chaotic some of the battles can be, this is a feat unto itself. Auditorily there isn’t much to go on here. The game is rather minimalistic in its audio approach. All of the worms scream in terror when bombareded with a weapon, and each weapon itself makes a sound effect that differentiates it from the others. Grenades sound like cartoon grenades, and sheep cannons sound like cartoon sheep. The whole Worms world comes to life in a big way without going overboard. So after almost 20 years, Team 17 are sticking to their guns. We as gamers always want to see innovation of our favourite franchises without sacrificing what made us love them in the first place. 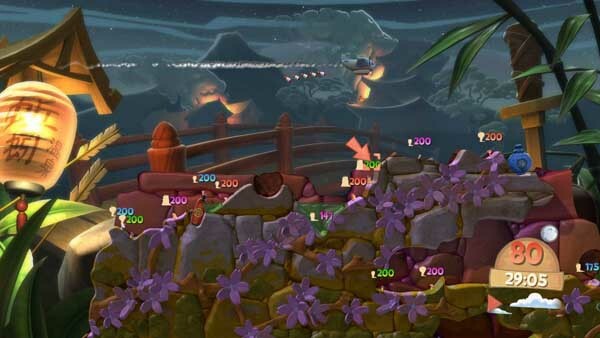 Worms definitely has the innovation, but nearly none of it takes place in Battlegrounds. Aside from the ability to make your own maps, Battlegrounds is more of a collation of past good ideas. It is still fun, and will give you and your buddies a laugh on a Saturday night, but it isn’t anything that you haven’t played before.